Peter Bryer: Mobile Foresight: Is four the new two? 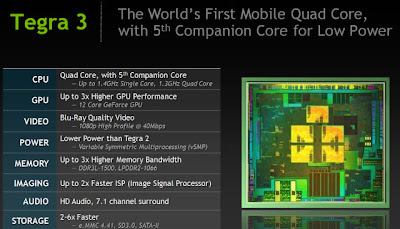 Mobile quad core arrives right on time. Two, we hardly knew ya. To me it seems like a bit of an overkill. If you see their explanation of the architecture, only the 500 Mhz companion core is active during 1080p video playback, meaning that the graphics accelerator does the video decoding & post processing. I wonder what's the need for the 4 full-speed cores? Bragging rights, maybe.